This is a great icy morning breakfast! Recipe is from here. Kirk thought these were pretty tasty even though he doesn't like pancakes. 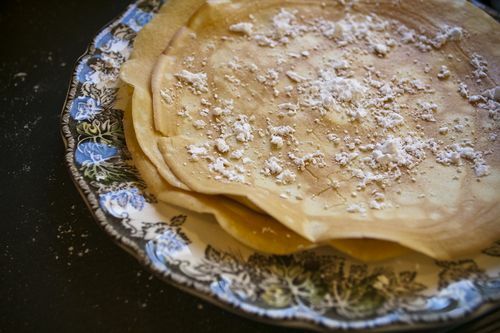 These are more like very thin pancakes - almost crepe like.We were out of syrup so I just had mine with powdered sugar.VERY easy to make! 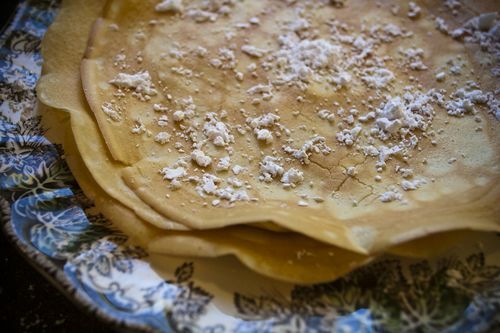 The pancakes looked great on my inherited dishes from Kirk's grandmother - Friendly Village. Looking forward to using them more during the holiday season.